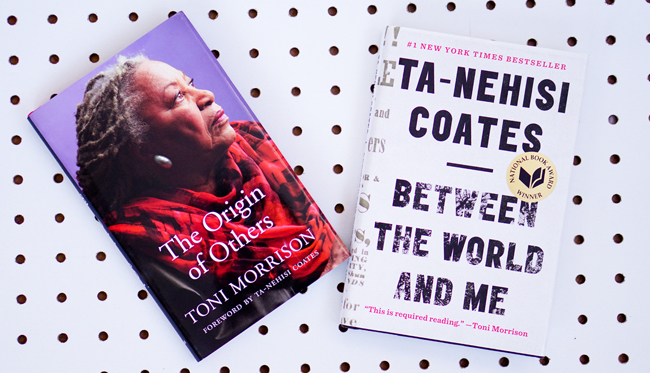 Shortly before the release of Between the World and Me in 2015, the book's publisher released a book blurb by Toni Morrison about Coates and his book. She praised Coates's work and linked him to James Baldwin. Morrison's assessment of Coates would stick,, particularly her suggestion that Coates was filling "the intellectual void" left for her after Baldwin's 1987 death. As arguably the most critically acclaimed living novelist, Morrison hardly needs endorsements from younger writers. However, her support for Coates, whose fame quickly rose, also ensured that Morrison would benefit in some ways from the association. A large body of commentary was being produced on Coates, and Morrison was regularly mentioned. The blurb placed Morrison in the conversation about one of the most widely discussed books in 2015. When Morrison published The Origin of Others (2017), who was selected to write the foreword? Well, naturally one of the foremost African American writers in the world -- Ta-Nehisi Coates.